When I first picked up Dividing Eden to read, I'd read several fantasy books in a row. And while I enjoy the genre, I'm realizing more and more how heavy these books can feel. They're typically longer in length and have to spend as much time establishing and constructing the world for the reader as they do exposing and delving into the characters. They're just not typically books that I end up categorizing as "light and fun". There's nothing wrong with that, but I'm finding that I need plenty of light and fun mixed into the heavy to keep a good balance and to avoid reading slumps. That being said, I didn't pick up Dividing Eden at the best time, and even though I was about 10% through and enjoying it, I decided to put it down in favor of some contemporary reads. 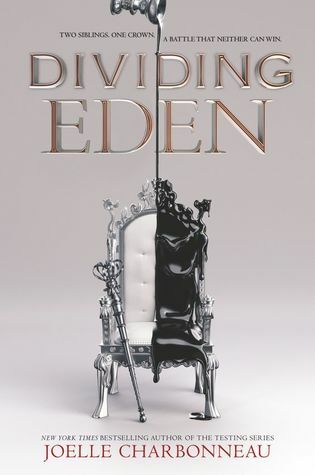 After reading a few contemporary reads, I won't say I was yet in the mood for the fantasy genre again, but I decided to read a little in Dividing Eden since I'd already started it. And then ended up deciding to finish it. While I was intrigued and interested in the plot and the questions that the book caused me to ask--initially, which character should I be rooting for? who is the true villain? what secrets are certain characters hiding? and will there be a romance?--kept me reading and not wanting to put the book down, I can also see where not all readers will feel the same way. There are hints at some potential romance, possibly even a setup for a triangle. But I see the potential for some readers to feel like this book drags on rather than keeps them hooked. For myself and other reader friends that I know in real life, the lack of romance for Dividing Eden could easily be something that slows them down. Another issue was the world building. There was much left unexplained and ambiguous. For instance, the Xhelozi. 1) I didn't even try to pronounce this word so I skimmed it every time I came across it and that is a pet peeve of mine. 2) Their origin story or even what they were besides hairy and?? scaly monsters that apparently eat humans is all that we really were told. 3) Basically anything else about them we have no clue. There's apparently some sort of wind generated power system that provides the electricity needed for the lights that may or may not keep these vague Xhelozi creatures away. That needed a bit more exploration or explanation. The system of Elders that stand for certain virtues yet are vying for political power was a bit confusing if only because there were so many of them and it was hard to keep the names straight with who was who. Speaking of virtues, the trials that Carys and Andreus participated in were supposed to coincide with the specific virtues that the monarch of Eden is supposed to protect and embody. These felt totally random to me. How archery has anything to do with humility is beyond me. And even the magic of the world itself was completely ambiguous. There are Seers and curses and these creatures I mentioned and apparently an ability to control the wind, but it was hard to tell which of these things were legit aspects of the world and which were perhaps imagined by the characters. All of this to say that even though I was interested in the plot and what was happening with the characters, this world needed a bit more polishing. Of course, I try to withhold judgment because sometimes the world building is so tied to the plot that it needs to be explored only at the proper times, but Dividing Eden just left me scratching my head in one too many areas for this to be the case. All of that being said, I was interested in the characters. Both Carys and Andreus narrate alternately. And this led to questions of who I needed to be rooting for. In the beginning, which character that should be wasn't entirely obvious. Yet as the book progresses it becomes more and more clear. At their birth, a Seer pronounced that one twin would be light and one would be dark. Andreus has been cursed and Carys has always been raised by her mother to be his protector. To keep the secret of his curse. And so to divert attention away from Andreus many times Carys has taken lashings and more to be this for her brother. So much so that she's become addicted to a drug called Tears of Midnight. Andreus is compassionate to those who have been in a similar situation as himself. Though not cursed, Andreus takes under his care a young boy named Max who has a condition that would appear similar to asthma. Andreus also loves to be involved with the study of the windmills that keep the lights on in Eden. But as I was discussing earlier about things being left unexplained, what exactly is Andreus's curse or the attacks that he gets was left vague as well. Basically he seemed to have panic attacks from what I could tell. Why that's considered a curse wasn't really explained either. Andreus and Carys both have a spark of potential romance. Andreus has feelings for the unattainable Seer of Eden, Imogen. Carys finds an unlikely ally on a foreign Trade Master named Errik, and also potentially her older brother, Micah's, best friend and nephew to one of the Elders, Garrett. Garrett is next in line for the throne after Andreus and Carys. All three of these potential love interests appear to have secrets and knowing who to trust isn't easy. Some is revealed but not all. And as I mentioned before, there's not really enough happening in the romance part for this to be a driving motivation for some readers to keep turning pages. Oh and yet another thing is the Queen Mother. I felt like she was basically an inessential character. Since even though she should have taken the throne after the King and Crown Prince were killed a successor after her would still have to have been chosen. She could have told Carys and Andreus about the curse and then died when they were younger. I supposes she had a small role to play in almost seeming like a Seeress herself, but I really feel like any information that came from her could have been handled in another way. Unless she has a much larger role to play in the next book. Cutting her character might have saved some much needed pages that could have been used for world building. I know that I've done a pretty detailed critique of this one and perhaps done a better job discussing what I disliked than what I did, but I truly didn't overall dislike the book. Dividing Eden definitely has some flaws and parts that need more explanation and smoothing out, but I did feel invested in the characters (specifically Carys) and I personally did want to keep reading to find out more. I can't say for sure yet whether I plan to continue with the series or not. I will probably need more information concerning the events of book 2 and how many books will be in the series before I can decide. But I am intrigued. If I do continue the series, I seriously hope there's more in the way or romance and some added backstory for the world. Ultimately, I think Dividing Eden gets 3 Stars. I didn't love it, but I can't say that I disliked it either. Have you read Dividing Eden? What did you think? Let me know! I thought this one took way too long to get going. But I ended up enjoying it for the most part. I agree that there were a lot of things about the world that were a bit muddled. I think my teens will like it more than I did, since they can't seem to get enough of these kinds of books. Great review. I had a lot of similar feelings when I was reading this one. A lot of things just didn't make sense; the trials were kind of a joke; and I kept getting a lot of the secondary characters confused, too. I'm glad to see that I'm not alone! Thanks for commenting Angela! Yes! I'd agree that it was a slow start, and you're right, teens will probably like this one more than I did as well. Thanks for stopping by Annette!